A chance move to Philadelphia as a result of the panic of 1837 determined Jay Cooke's future career, with his eventually ending up as a partner in the distinguished banking house of Clark & Company in that city. Retiring as a wealthy man in 1857, he could not stay idle long, and founded Jay Cooke & Company in 1861, destined to become one of the most widely known banking houses in the country. Serving as treasury agent for the U.S. government during the Civil War, Cooke's banking house handled with great success the larger part of the $2 billion in bonds which the government issued to finance the war effort. After the war, Cooke's banking house specialized in financing very large enterprises, most notably the construction of the Northern Pacific Railroad. In the depression of 1873, however, the house failed, helping bring on the panic of 1873. JAY COOKE (1821-1905) American financier. 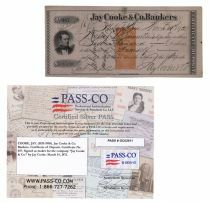 Partially Printed “Jay Cooke & Co Bankers” certificate of deposit Signed as maker for the company by Cooke, “Jay Cooke & Co.” 7 1/4” x 3 3/4”. Philadelphia. March 14, 1872. Vignette of a male at left. Orange revenue underprint. Pen cancelled. This item is accompanied by a PASS-CO certified Silver PASS. Very Fine.